What is That Mysterious Concrete Bunker at Stewart International Airport? It’s been called the most mysterious building in the mid-Hudson. The Evening News called it a “great block of self-sufficient rock.” Both are apt descriptions for Stewart Airport’s Semi-Automatic Ground Environment building, or SAGE, an almost eerily non-descript, five-story, windowless brick building painted two similar shades of beige, standing on the outskirts of the airfield. (For our modern audiences, may I recommend the Great Stone LEGO?) 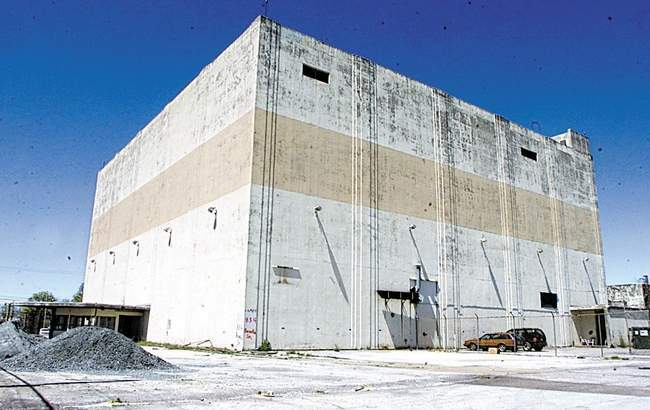 Whatever you want to call this hulking concrete cube, for decades the U.S. government had just one name for it: The First Line of Defense. The Port Authority of New York and New Jersey’s Stewart International Airport has a long and storied history with the United States military. The airfield started in the 1930s as a cadet aviation-training site for the nearby U.S. Military Academy at West Point, eventually becoming the Stewart Air Force Base in 1948. Though the base was decommissioned in the 1970s, Stewart remains a military (as well as public) airfield and the home base of the New York National Guard’s 105th Airlift Wing. But the most curious military artifact at Stewart is undoubtedly the SAGE, an obsolete structure that hearkens back to the mid-1950s and early 1960s—a time when paranoia was the fundamental driving force behind many military decisions. Perhaps most interesting, Stewart’s SAGE is not one-of-a-kind; at least eight Semi-Automatic Ground Environment buildings still exist, dormant and foreboding, across the United States. The purpose of the SAGE, Stewart’s included, was simple: They were the ultimate line of defense from a Soviet nuclear attack, a bulwark from an act of war that seemed inevitable in the 1950s. The SAGEs directed and organized the North American Aerospace Defense Command’s (NORAD) response to a potential Soviet air strike by coordinating data from numerous radar sites into a single, comprehensible image. Radar images picked up in New York, for example, could now be viewed by radar operators in California, in real-time via telephone lines. For a pre-connected world, this was astonishing. The 18-inch, reinforced concrete walls of the SAGE safeguarded supercomputers and networking equipment —the vacuum-tube computer IBM AN/FSQ-7 to be exact— fantastically large computers whose circular, monochromatic display screens and endless corridors of equipment are etched in popular lore, played up in movies and old science fiction tales. Though the computing power of the IBM AN/FSQ-7 pales in comparison to a modern-day smartphone, the computers were—and remain—the largest ever built. The interior of the building was almost as haunting as its menacing exterior. An article published on the Hudson Valley’s Times-Herald Record described the SAGE interior thusly: On a wall on the top floor — the war room — was an etched-glass map of the eastern U.S. showing potential Soviet bomber targets, and a board evidently meant to track the progress of the war to end all wars. Thankfully, a Soviet air strike never came. And though air security is still paramount to America’s overall defense strategy, we have long since moved past using the SAGE buildings to protect our airways. Throughout the country, then—at Truax Field in Wisconsin, Minot Air Force Base in North Dakota, Hamilton Army Airfield in California, and other locations—SAGE buildings remain, repurposed as combat-training centers, museums or collectors of dust and ghost stories. The Stewart Airport’s SAGE—as far as this author can tell—belongs to the latter group; there was talk for years of turning it into a Cold War Peace Museum, but the proposal never got past the planning stages. For now, Stewart’s SAGE remains, mysterious as it is historic. Though it no longer provides its intended duty, the SAGE still has a value as a totem, a reminder of a more tense time when the world depended on these giant concrete buildings, these “great blocks of self-sufficient rock” to keep us safe from the dangers above. This entry was posted in airport history, aviation geeks, radar and tagged aviation training site, cold war, Cold War Peace Museum, Hamilton Army Airfield, Minot Air Force Base, NORAD, nuclear strike, Semi-automated Ground Experiment, Soviet air strike, Stewart Air Force Base, Stewart International Airport, Truax Field, U.S. Military Academy at West Point. Bookmark the permalink.